I leave the expert advice to the experts. Ya know, the girls at The Chicken Chick and Fresh Eggs Daily. Whenever I’ve got chicken troubles, I usually end up there. 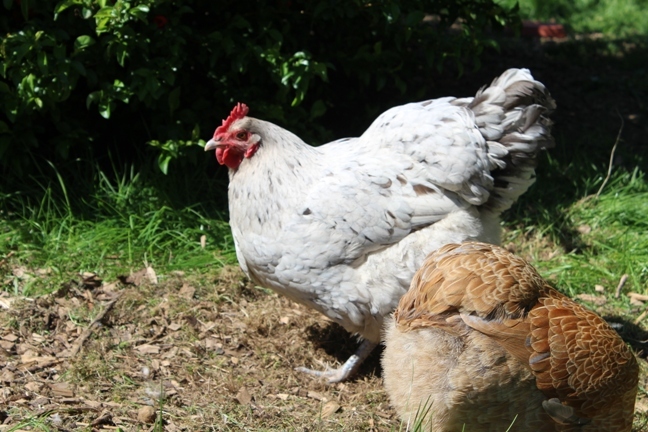 And of course, there’s always the fine folks at Backyard Chickens.com. Since we are rounding out our first full year of chicken-keeping here at the P Patch, there are many things we haven’t encountered yet. Like flock expansion. 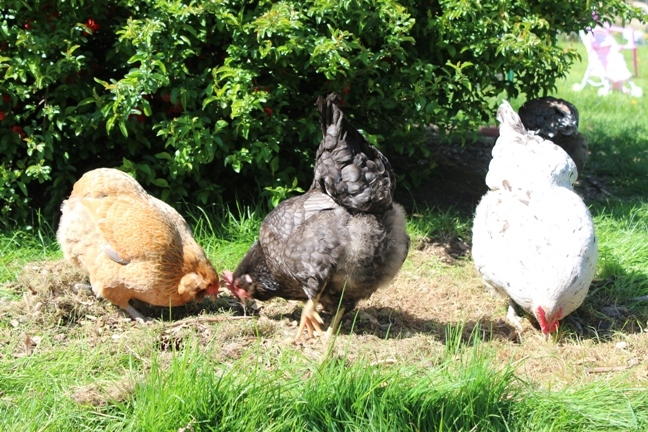 With three egg-lovers in our house, (and another one on the way), AND the mysterious phenomenon that the more fresh eggs you have, the more you need; it’s easy to see that the math isn’t adding up and we need more hens! Obtain some ridiculously cute Blue Cochins and ridiculously ugly Turkens at 3 days old and raise them up a bit. We set up a nursery inside for two weeks and Sweet Toddler though this was the COOLEST! After two weeks, move then hens out to the garage and after a few more weeks, begin to turn the heat lamp off more and more often. 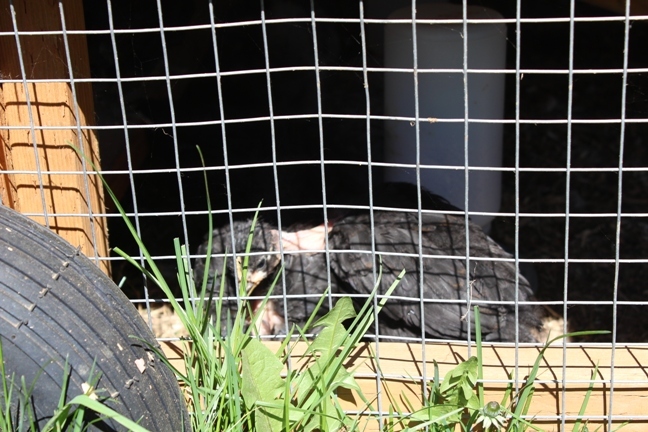 At about a month old, on sunny days, we’d allow the chicks to hang in our already established chicken tractor. Note: If you have a cranky hen like I do, this will really piss her off! Continue to bring the chicks back in for the night. 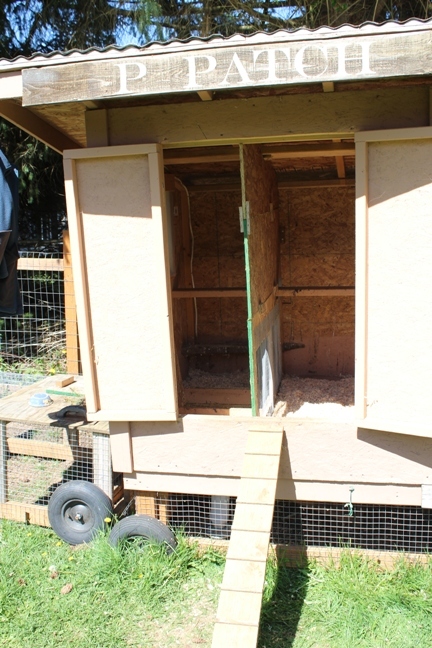 DH makes modifications to our coop. We got really lucky with the way we designed it. With a few light modifications, it splits in half perfectly, and one half hosts the big girls and their nesting boxes, the other half hosts the babies and their protected outdoor access. You’ll see what I mean once we get to the photos. The dividing wall has a large portion of wire, so the big girls can “look, but not touch” the little girls. 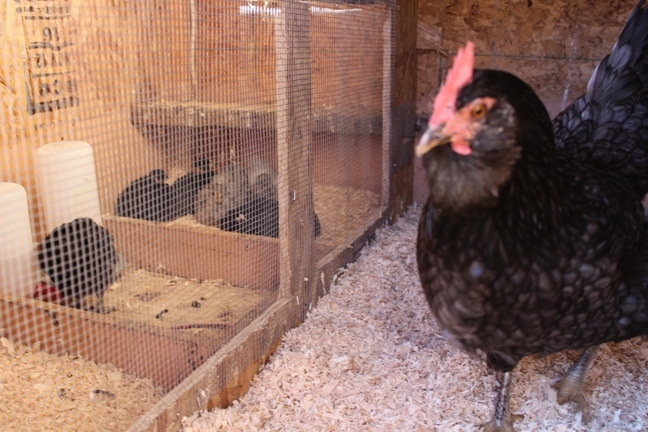 Move the babies out into the coop once fully feathered and weather seems decent enough. For us, that was at 5 weeks old. 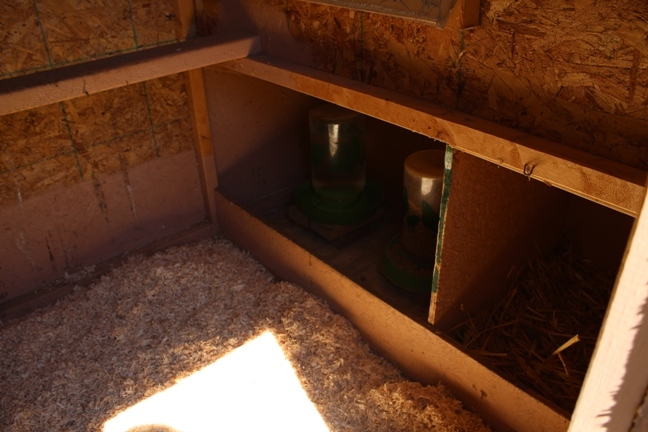 They were out into the coop full time, and some nights at first were a chilly 33 degrees. They did superb. I was worried sick, of course. 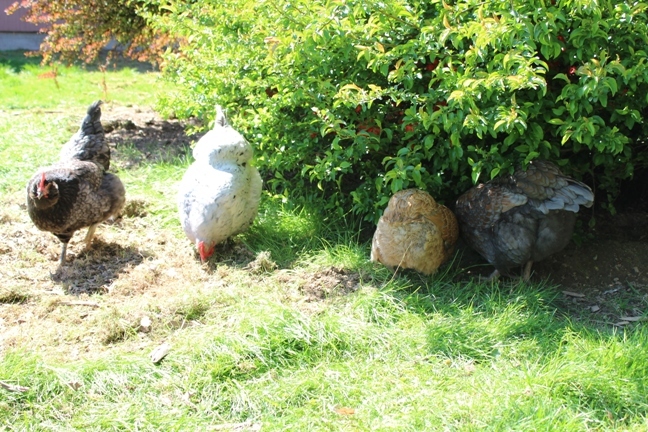 But they were feathered, ready, and outgrowing their nursery, so albeit the chill, I’m sure they were more happy in their new home. You see my pattern here? We are using a high visibility, “look but don’t touch” method for integrating the new flock mates. At first, Mean Hen, a.k.a. Melinda, would. not. shut.up!!!! I have only ever heard the hens sing their respective egg songs, but this new sound from Mean Hen was crazy madness. And it went on for 12 days… It was what I’m guessing her predator call sounds like, or her distress signal. 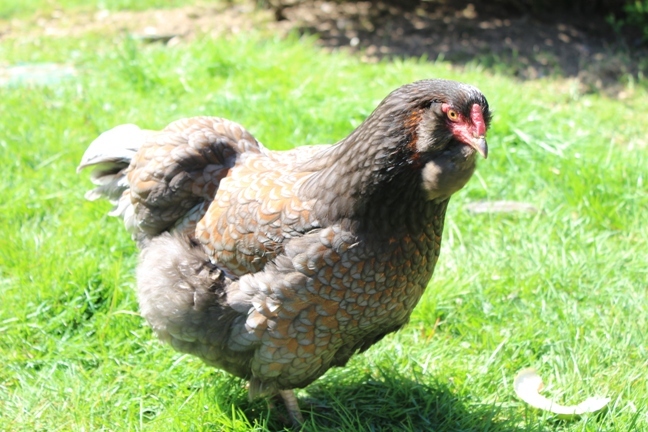 It’s loud, obnoxious, and well-loved by our neighbors, I’m sure 🙂 I never saw any pecking through the wire from her, just some stalking and shouting. She would hang in the coop more often than usual if the babies were in there. She’d take exxxxxxtra long to lay her egg, and she would put her egg-song on blast, right through the divider, at the babies. Yep. We hear ya, Melinda. Now, if you would kindly, STFU… She eventually got over it. The hen house and all of it’s glory. Here is a close up of the divider. 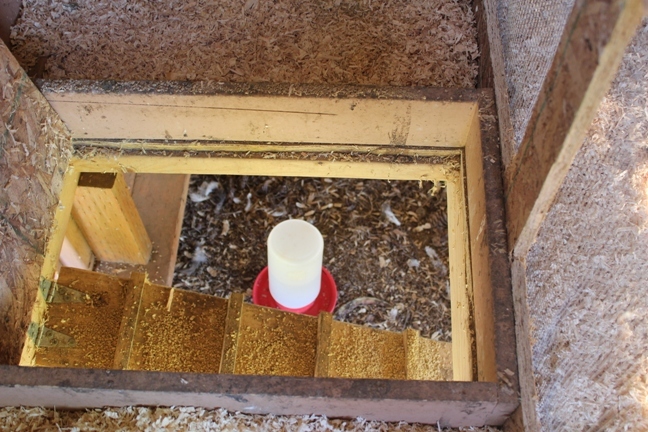 The hatch leads to the underneath part of the coop that is enclosed. It’s earthy, covered and dry. Very necessary in our little corner of the world. 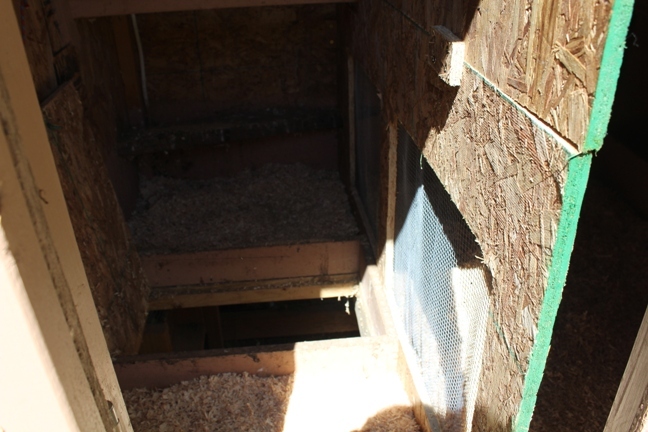 Note the angled roost in the corner. That’s been replaced with a larger straight one. 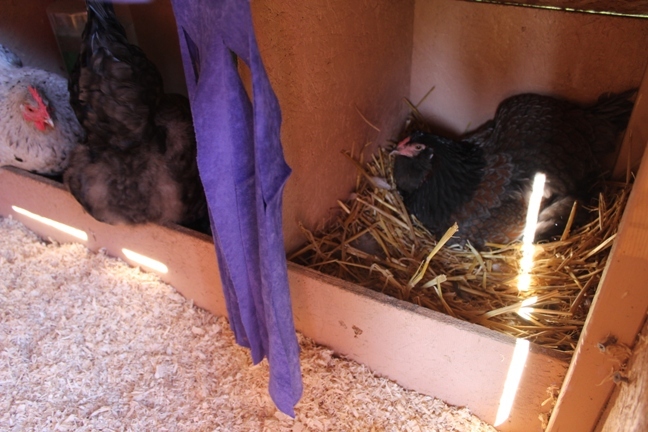 That old roost was left over fro when the Big Girls were babies. 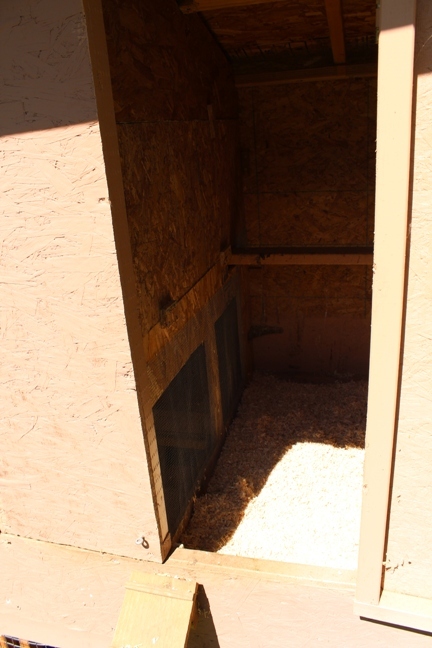 The left coop door stays shut at all times, keeping the babies safe. 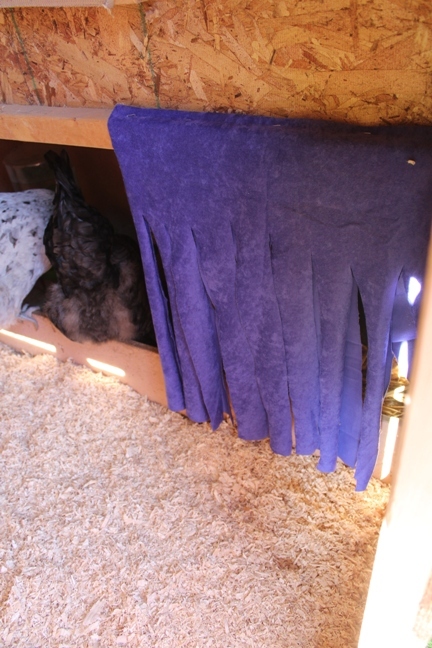 I added this curtain to the Big Girls’ nesting box, because Mean Hen was having trouble laying with the babies in sight. There was a whole lotta shouting, and not a whole lotta layin.’ All the girls seem to really like the curtain. So, I’d say Phase One is a complete success. Things have mellowed, the babies are adjusting, and it won’t be long before we can remove this ridiculous divider! I plan to keep them separate until the babies reach 12 weeks, because at that point they will be large enough to fairly compete when it comes time to re-establish the pecking order. Watch the blog for an Expansion Update, and a new blog post on our DIY tube feeders, made from PVC pipes. So, am I doing it right? What experiences can you share from your flock expansion? Let’s chicken chat in the comments below! Are you familiar with Turkens? What do you think of them? Are they as great as the chicken expert at the feed store says they are? Weigh in. 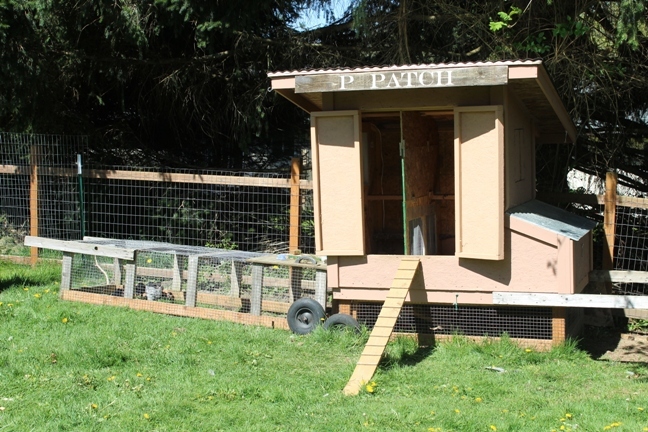 Awww, your hen house is awesome! Thanks! My hubby and Dad built it! They’re the best!